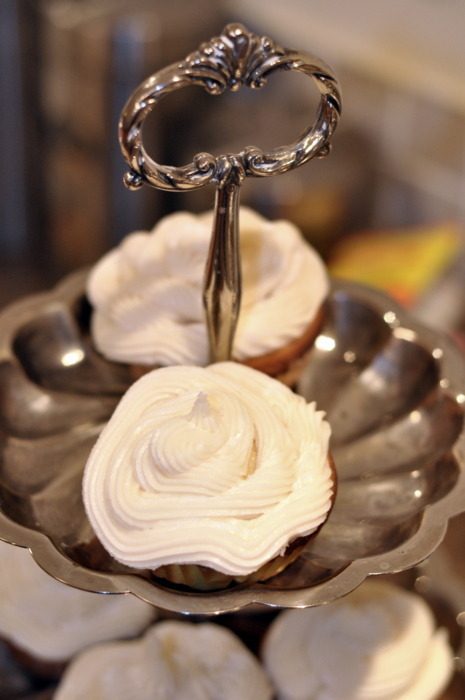 Back in the summer we had our first attempt at making the famous Magnolia Cupcakes. I thought I’d make them again for Frenchie’s birthday. This time I bought an icing bag and tips just for the occasion. The icing bag, 3 tips and 1 “coupler” ran me under $10. The coupler doo-hickey allows you to switch tips mid-ice. If you don’t have one you would have to clean out the bag, switch the tips, then start over again (so the cooking store cashier informs me!). The coupler is only a few bucks so it’s worth it if you want to give your ice-job some flair (does “ice-job” make cake-decorating sound more gangster??). Long story short the ice-job was well worth the $10 - the setup lasts forever and it makes the cupcakes look far classier. I did, however, wish I had gotten the bigger tips - the tips I got were the smaller kind and are more suited to doing accents than straight up icing. Worked decently - although I certainly hope to get better with practice! The tiered dessert tray adds another dimension of class - I’ve gotta get one when I move to my new apartment (my 4th move in 12 months. This must be a record). The party-goers mowed (maued?) them down along with the mango Alizé and baked brie. They went over great except they were so over-poweringly sweet most of us - myself included - could only finish half before admitting defeat. To be honest I had a lot of icing left over so I did a double-take to some of the cupcakes. I blame the sugar-high for Frenchie’s unstoppable energy on the dance-floor later that night.